Help us get this book out! Send a donation of $25 or more to Ed and Jacqui Close, P.O. Box 368, Jackson, MO 63755. Include a mailing address, and we will send you an autographed copy as soon as the book is published. … Life, in its many forms, is finite manifestation of consciousness, which is infinite. The most important discovery of TDVP is that there is a third finite form of reality, in addition to mass and energy. We call it gimmel. Gimmel is mathematically and physically required for sub-atomic, atomic, and molecular stability. ...The discovery and proof of the existence of gimmel eliminates materialism as a viable basis for science and human understanding. Spiritual evolution is the driving force behind the universe, not some random meaningless explosion, the conclusion of reductionist materialistic science. Reality does not, and cannot exist without consciousness. AN EXCERPT FROM "SOLVING THE MYSTERIES OF LIFE WITH THE RUBIK'S CUBE"
How can this popular puzzle/toy have anything to do with serious questions about reality? For me, the first glimpse of the potential utility of the Rubik’s cube for explaining the geometrical aspects of reality came when I found that the “intrinsic ½ spin” of fermions, the building blocks of the universe, could be physically simulated using the cube. Not only that, I discovered that the simulation provides a visual physical understanding of how intrinsic spin is simply the natural result of an object spinning in three, six or nine dimensions. This was an exciting discovery, but when I found that electrons, quarks, protons, and neutrons could also be modeled using the cube, I knew I was on to something. Imagine my excitement when I discovered that the cube could be used to simulate not only quantum physics, but also relativistic cosmology, and even spiritual evolution! 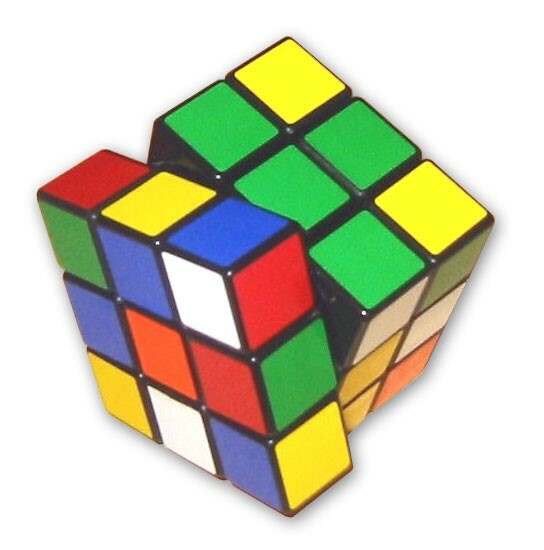 To understand how a simple Rubik’s cube can be used to simulate things as different and complex as particle physics, galaxy formation and spiritual advancement, it is necessary to realize that all possible finite patterns and forms are reflections of the structure of infinite reality, and that the structure of reality is pure invariant mathematical geometry. The Greek philosophers Pythagoras and Euclid developed much of the logical and geometrical basis for the mathematics of modern science. The axiomatic concepts upon which their work was based were drawn from observations of the natural world. They were, in fact, symbolic representations of the structure of reality. But the various forms of mathematical methods based on their work developed over the past few hundred years, have been used primarily for practical engineering and technical purposes. Because of this, most scientists, and virtually all engineers and technicians, consider mathematics to be nothing more than tools for solving physical problems, and the connection between mathematics and reality has been blurred, if not completely lost. Because of this, we find modern scientists and mathematicians expressing surprise when theorems developed in pure mathematics turn out to have direct correspondence with observable physical phenomena. This loss of awareness of the connection between mathematics and reality is the hidden cause of a major problem in modern scientific efforts to produce a successful mathematical representation of reality. Without re-establishing this most basic connection between mathematics and reality, finding anything approaching a “theory of everything” is impossible. This problem, endemic in modern science, once identified, is surprisingly easy to resolve. Let’s have a brief look at how the problem arises, and the solution. Some statements we hear from modern scientists are symptomatic of the problem: Physicists today declare that there are two different sets of mathematical rules for physics, one for the macroscale and another strange, counter-intuitive set of rules for the quantum realm. And they can’t seem to resolve the conflicts between the two sets of rules. Intuitively, they must know that reality is internally consistent, and that the conflicts really just indicate that one or both sets of rules are either partially wrong, or incomplete. At the root of the problem is the misapplication of a mathematical method that has been known as “the calculus” for more than 300 years: the calculus of Newton and Leibniz. The fact that it is called the calculus, and not just “a calculus”, is also symptomatic of the problem. It is in fact, just one of several calculi that can be defined at the interfaces of dimensional domains. It happens to be defined at the interface of space and time, which makes it very useful for analyzing and solving everyday problems involving motion. Like all puzzles, once the nature of the problem is understood, and a solution is found, we often wonder how we could have missed it for so long. This is no different: The fact that “the calculus” doesn’t apply at the quantum level should have been obvious. The only excuse we have is that the calculus was so successful solving everyday problems that we simply didn’t think to look at the basic assumptions behind it. If we had, it would have been obvious that there was a serious problem.